It’s relatively well-known that Michelin is one of the oldest tire manufacturers in the world, so old, in fact, that it got its start making bicycle tires—there were hardly even cars to make tires for in 1888. Now however, the scales have turned, with bicycle tires making up but a minute fraction of Michelin’s production. But, that’s not to diminish Michelin’s rich cycling history, nor their prowess in the human-powered segment of the tire market. Laying claim to one of the earliest patents for a pneumatic bicycle-tire, Michelin’s first tire has an impressive pedigree, winning Paris-Brest-Paris in 1891 under Charles Terront. Fast-forward to the present though, and you’ll find Michelin laying claim to the title of ‘Largest Tire-Manufacturer in the World’. A multi-billion-dollar gargantuan of a company, Michelin’s car-tire research and development budget alone is a billion-dollar-plus—yep, that’s billion…with a B—endeavor. And, while their bicycle-tire division’s budget is but a fraction of a percentage point of that, they do happen to be in the rare position to benefit from a billion-dollars-worth of trickle-down technology—few, in fact, no other bicycle tire manufactures can say the same. So why then did Michelin choose to launch four new bicycle tires in a small town in Florida? To put it simply, 3.7 miles of some of the roughest asphalt and concrete to grace the American LeMans Series. That, and Michelin just so happens to be the raceway’s tire sponsor. Also, as a result of Michelin’s “learn by racing” philosophy, it’s also the perfect spot to see a big chunk of their billion-dollar R&D budget in action. But, getting back to those four tires—Michelin has decided to fill out its top-tier PRO4 road line with three new models. 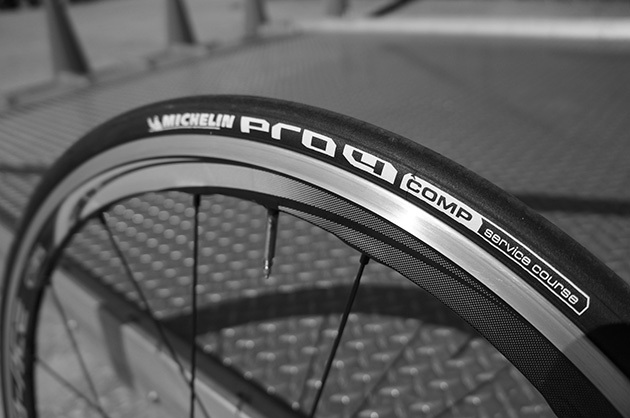 Joining the PRO4 Service Course are the new PRO4 Comp and Grip clincher models as well as a new tubular offering. Whereas the PRO4 Service Course merely applied a different rubber compound to the existing PRO 3 casing, the new Comp model brings to market an all-new casing design built around a never-been-done-before 150TPI nylon carcass. Good for a 20-gram weight-reduction (bringing it down to 180-grams for a 23C tire) and 7-percent drop in rolling resistance over the PRO4 Service Course, according to Michelin. Pricing for the Comp is set at five dollars more, at $80. 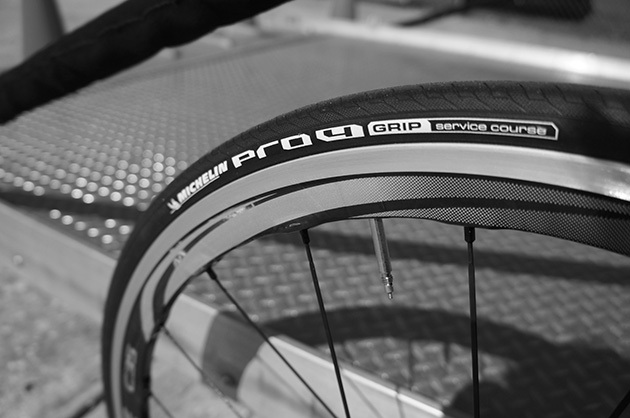 Also new is the PRO4 Grip, which utilizes the same PRO4 Service Course casing, but uses a textured, siped, tread pattern, which Michelin claims improves wet grip by 15-percent over the Service Course, while puncture-resistance is increased by 20-percent. Michelin accomplishes this through the use of a different, higher-durometer rubber compound and a wider, aramid breaker layer. Weight, predictably is a bit heavier, with the PRO4 Grip weighing in at 220 grams per tire in 23C guise. The Grip will set customers back the same amount as the Comp, at $80. Rounding out the PRO4 clincher lineup is the pared-down race-day-oriented PRO4 LTD, which will be available later this year. Using the same high-thread-count casing as the Comp, the LTD foregoes that model’s nylon breaker layer and sports bit thinner tread, losing 15 grams in the process. Even more impressive though, is the claimed 20-percent reduction in rolling resistance over the Comp, due to the elimination of the breaker belt and slight reduction in weight. 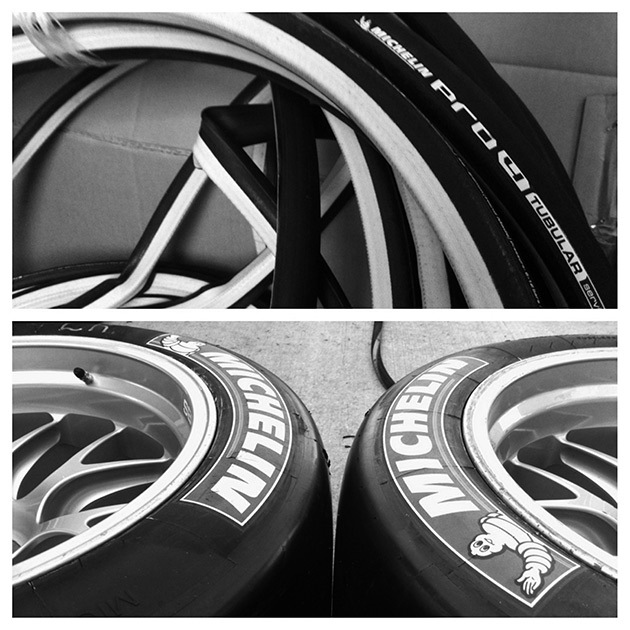 After a ten-year absence in the U.S. tubular market, Michelin’s PRO4 Tubular, finally makes its way to consumers, after being raced under the Ag2r-LaMondiale squad last season. Featuring a 290TPI (higher TPI numbers are much easer to achieve with cotton (a thinner fiber) than nylon (a thicker, stiffer fiber) cotton casing—which lends itself to the fully round shape of a tubular much better than nylon, the PRO4 Tubular tips the scales at 280 grams (23C, 295 grams for 25C) and will command a price tag of $120. So without further adieu, be sure to take a look at our gallery from Sebring, shot during the American LeMans Series Winter Test Period held there. Why are race cars relevant, you ask? Well, odds are, the next set of Michelins you throw on your bike will feature technology gleaned from the racing R&D efforts conducted on this very track. Besides, they’re just plain bitchin’.